Did you know that more than 12,000 fires are caused every year in the U.S. by clothing dryers and dryer vents ? It’s true. It is a statistic that shouldn’t be ignored, and can be easily avoided with proper dryer vent cleaning. When lint builds up in vents, it restricts airflow, which increases drying time and causes the motor to overheat. If this happens, the lint underneath the dryer can catch on fire and be drawn up into the duct by the air draft. Should the duct be coated or blocked by additional lint, an entire house can go up in flames. Many other factors can lead to fires in dryer vents, as well. Thermostat and limit switch failure, missing or damaged lint screens, crushed hoses behind the dryers, or even bird’s nests or other debris that blocks dryer vents. The point is simply this: Dryers are hardworking appliances that must be maintained with care in order to ensure the safety of your property. How do you know if you need dryer vent cleaning? A simple rule of thumb is to evaluate the drying time on your laundry. If your clothes aren’t getting dry the first time around, it’s probably time for dryer vent cleaning, as it could mean that a buildup is decreasing the dryer’s efficiency. Also, if you run your dryer frequently and haven’t had the ducts cleaned for more than a year, it’s likely time to call in a pro. At American Duct Cleaning, our team is fully equipped to handle dryer vent cleaning for both residential and commercial facilities. Our crew works to remove lint, dirt and debris to restore the open passageways that enable total airflow, increasing the efficiency of your dryer, dryer vents and reducing your risk of a fire. 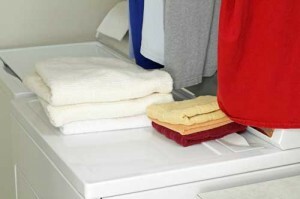 Plus, you’ll also save money on electric bills as your drying time will decrease. If you think you might need dryer vent cleaning, then you probably do. Call American Duct today at (816) 537-0318 or (913) 681-9032!